G'Day friends! Welcome to Natasha in Oz! Thanks so much for stopping by and spending time in my little corner of the world Down Under. I am seriously in love with plates at the moment and I have been slowly trying to find some pretty plates to display in our home. I have finally found enough to hang on a wall and I can't wait to show you my collection! Aren't these collections so beautifully displayed! Now, I only have a small little patch of wall to hang my plates so I originally thought that I should simply hang them in a row like this. But then I decided that I like this display a little more as it seemed to be more fluid and would allow me the freedom to add more plates as I found them. So here is my before picture. And here is my after picture. As I said, I only have a tiny collection but I had to start somewhere, right! I have seen a few bloggers have used these before so I also used these great adhesive plate hangers for the two little bitty plates. stick it on, wait for 24 hours and then voila-instant plate hanger! Here are some close-ups of my plates. The Scottish inspired plate is a J &G Meakin Prince Charlie Cake Plate. It used to belong to Mr Attorney's grandmother. The little tiny floral plate was found at a garage sale and cost me 20 cents! My favourite plate is the chintzy Royal Winton Welbeck pattern. Mr Attorney gave this to me for my birthday last year. It is a vintage piece and was about $50 from an Antique market. The Royal Grafton Malvern Eared Cake Plate is also beautiful and came with a cute cake server. I am so happy with my plate display and I can't wait to add a few more to my collection! Thank you to my Dad for helping me put them up! Big Al is obviously in deep admiration of your plate-hanging skills! Thank you to you, dear friends for taking time out of your busy day to spend time with me. It makes my day when friends pop in to visit! I love plates also and love what you have so far, each and every one of them. Have fun and never saw that plate hanger (great idea). Love your plate collection, even if you think it is small. Have to start somewhere. Have a great week. I'm stopping by from Rhoda's Thifty Treasures. I loved seeing the examples of plates as art but be careful, plates can be addictive! Yours are lovely. weakness for lovely china, too. I'm glad to hear that you are pleased with the adhesive plate hangers. I have a big plate I want to hang, and I'm considering using one of these. Just have to get busy and see if I can find them. Wonderful mosaics, Natasha, of your pretty plates! Thanks for showing that photo of the white ones with the lime green ribbons...you've given me an idea. Thanks too, for the tip on how to hang them. Natasha, I so enjoyed seeing all the plate collections and yours was great! I love plates on the wall. I have started an ivory plate collection, but by the time I get enough to hang, I'll probably repaint the walls and they won't compliment my new color! LOL! Love them all, you start a great collection. They look great and you can add as you find the right plates. Great job. Katherine, I definitely want to visit you soon! When we next have a free weekend I am heading your way! I love your plate display. I used to have one but I put it away. Maybe I will get it out again (if I cant find it). I loved the pictures you posted about plate collections. I really love the all white one. I would never think of doing that. You have been busy with a lot of linky parties. They all look like fun. Take care. So nice to see a familiar face on SITS Day! I am in love with all of those plates designs. I think your plates look marvelous...I am all about things I can hang (my kids cannot get them). I have never seen those plate hangers...wonderful. Thanks for sharing your creativity! 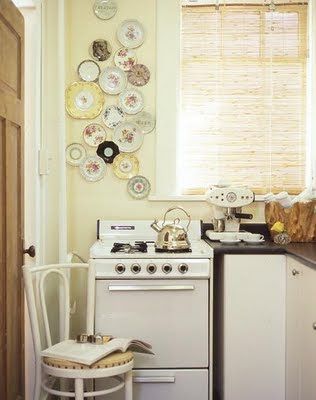 I'd love to hang some plates..., I've seen some really cool coastal ones too, and it seems easy as well! Love your plates! I have some hanging in my bedroom. Your mosiac is very pretty! Thanks for stopping by my blog! I love your plates. I have never seen plate holders like those. I will have to google them. Good mosaics and good post. Hi Natasha, thank you so much for your kind visit!! Love how you displayed your plates...I'm planning to hang a few red english plates as well and you gave a lot of inspiration, thank you!! Hi Natasha, that was fun to see all these arrangements of plates. All are looking good but some are really outstanding. I enjoyed the set of Layla Grace. So cute. And the very modern one of Apartment Therapy looks very different but interesting. I like your collection and it makes the room much nicer. What a fun project! An easy way to experiment is to cut your plate shapes out of paper and try rearranging them until you get something you really like and then follow that pattern on your wall. 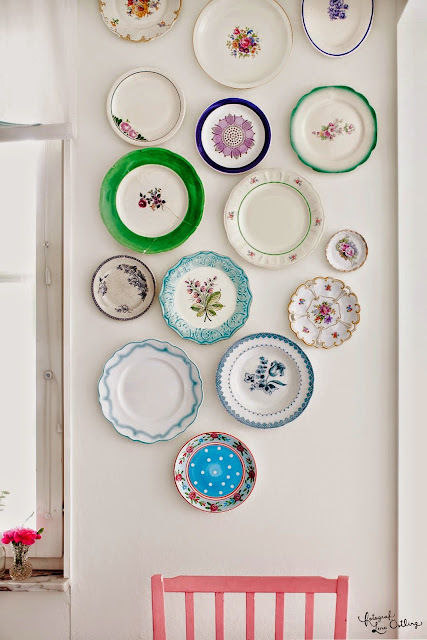 I LOVE that you are waiting and choosing beautiful plates and not just something to fill up your wall. These all look FANTASTIC together. You are doing such a good job..
Love your plates! Please be careful not to use those sticky hangers on any plate of either sentimental or cash value as they are not perfect and can dry out! I used to hang plates on the walls when we lived in the UK and one smashed when the holder dried out and the plate fell off the wall. Hi, Natasha, nice to meet you all the way over there in Aussie land! You can't go wrong with decorating with plates. I have many in my home too & love collecting them. You did a great job with your first ones, careful it's addicting! Lovely done !!! Catherina !!! HJave a great sunny happy week !! Wow Natasha, they look great. I realize after looking at all the photos that I don't have enough plates! I had 3 in a row which just wasn't enough. I think plates are a little piece of art..Thanks for inspiring me. Your plate plan is lovely....I love how they balance with your teaspoons!! What wonderful picture you shared with us. Your plates are so nice; won't you have fun getting them organized; please post your pictures. Nice arrangement! You sure started on the right track. Don't forget to show us as your collection grows. Oh Natasha your plate collection is beautiful. They look so pretty hanging on your wall. Super job!!! By the way....love all the inspiration pictures. 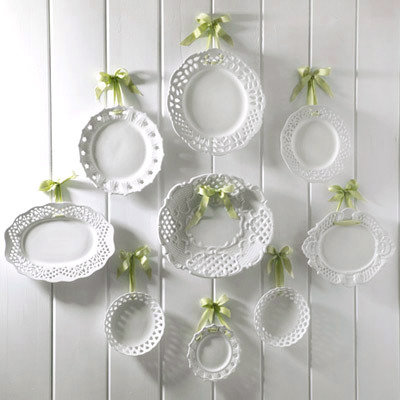 I've been meaning to hang some white plates on my dining room wall...You have totally inspired me. Thank you :-) Have a wonderful new week my dear friend. 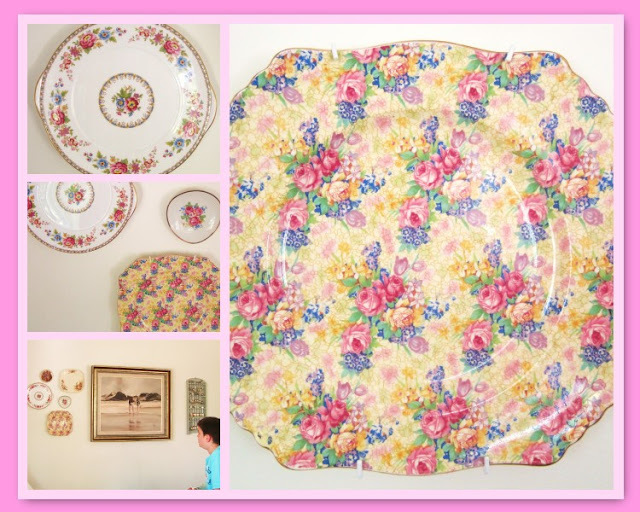 Love your grouping of plates; especially the chintz! I have never seen those plate hangers before. Hope you're having a wonderful day and hope to see you Tuesday for Tea Time. 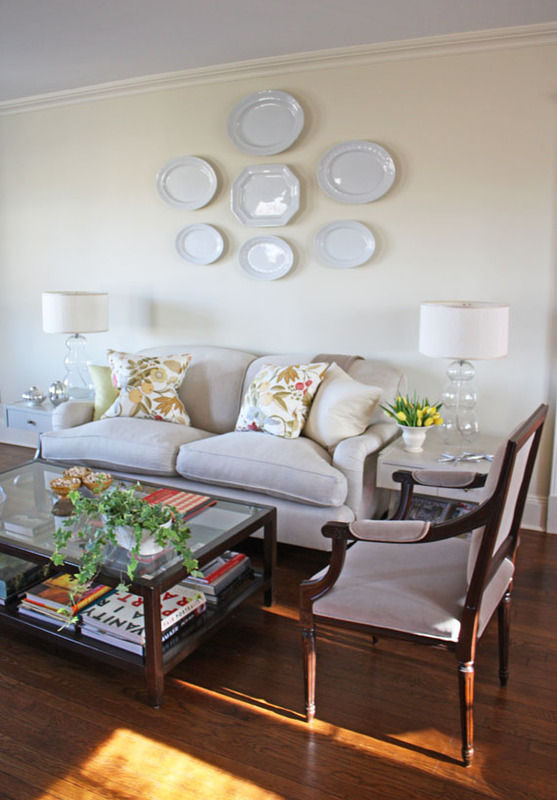 LOVE LOVE LOVE your plate collection & how you arranged them! Looks just like all the magazines to me! Your plates are lovely! It's so much fun to find treasures like that, and even more so as a family heirloom. Good decorating! Love all the inspiration. Great job with going victorian on those plates. They are fantastic. I know a whole lot of people who would like to get there hands on some of those plates. Hi Natasha, you collection may be teeny but it is lovely. I adore all of them but the square plates are especially pretty. I loved the inspiration photos and I think your arrangement could be one of those photos. Good job hanging them. Your dining room is beautiful. Your arrangement looks wonderful! I do hope you'll add to it - there's nothing I like more than an organically expanded collection. So much more fun than a grouping of stuff all bought at the same time. I am not related to Nancy - I just like her blog and think you will too. Hey, let's have tea tomorrow! Your little collection of plates is beautiful! It's not the quantity but the quality that counts! Love the pink floral! 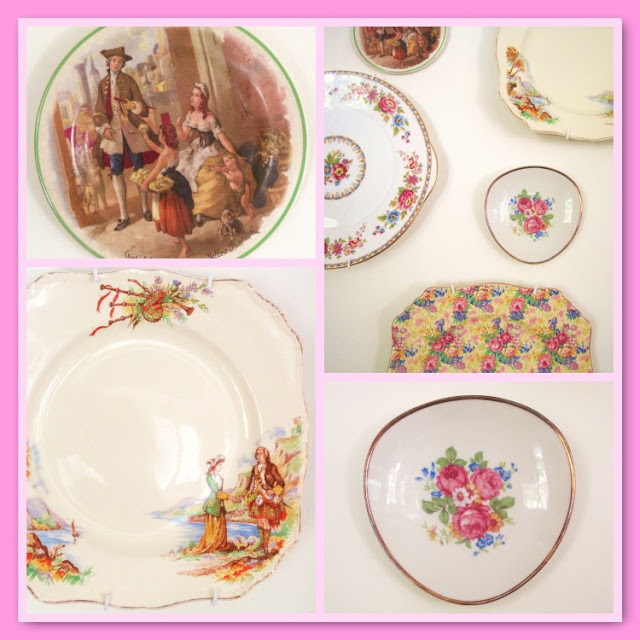 Love your collection especially the little plate with the people and the chintz one. I do love plates too! Koralee from Bluebird Notes has inspired me to start collecting even more plates... 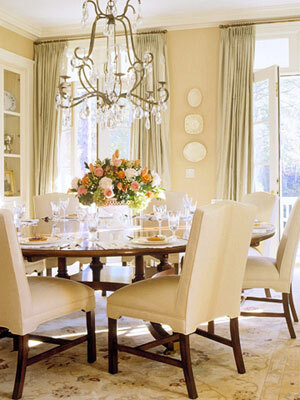 I do have that collection from Layla, the all whites, they hang in my dining room, and I adore them. Love your collection. My absolute favorite is the yellow chintz. I have a tiny collection of chintzware started. I need to stop collecting things or move into a bigger house! Your plates look fabulous. Here's wishing you find more that you love! Natasha darling, first the spoons and now the plate and the wall is complete. I love your plates, my very favourite is the Lady Crinoline plate, so lovely. My cottage walls are covered with plates. I also have plates on top of my windows and around the arches. Have a lovely day darling. Oh wow, love love love them, especially the Gaita and the Home Life collections. Natasha darling thanks so much darling, you comment meant the world to me. I treasure our friendship and I truly feel blessed that our blogs crossed paths; you are a rare gem, thanks luv. Oh, what a beautiful and useful post all in one! I love using plates in design, but did not know about this great product for hanging..plates can make such a statement as some of these breathtaking rooms show..thanks for bringing these to us, Natasha! Your china plates are just beautiful! Love the Elle decor collection! Your plates look great and thanks for showing how there hung, you have inspired me to hang some of mine, Have a sweet day! Natasha, the plates are very sweet but it's your new profile picture that's REALLY LOVELY! What a gorgeous smile. Now - how can you expect me to notice plates after that revelation? Having said that - I was going to ask you how you got them to hang so well. LUcky you explained ;-) You're always wondrful in your explanations. Love your pretty plates - my Mum collects gorgeous teacups and saucers which unfortunately you can't really hang on the wall! Love your inspiration photos, especially the classic Kelly Wearstler wall, and that gorgeous blue and white Country Living shot. 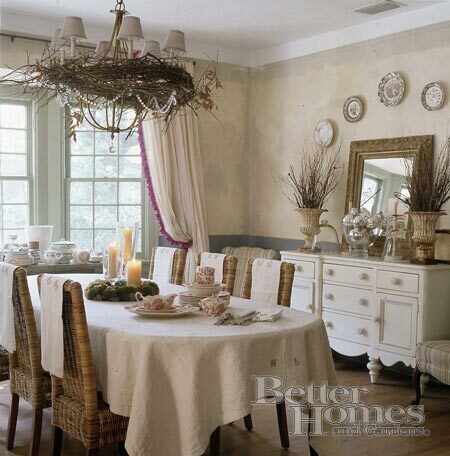 I think collections add such a lot of character and personality to a home! O what a beautiful mornin! Red gerbera in the RAW!